Artificial intelligence can transform education by putting learners in charge of their own education, by shaping the learning experience to widely varying needs and through redefining the traditional roles of schools and universities. But there is too much hysteria and many over inflated claims. What is needed is a measured approach and a realistic understanding of what can be achieved and how to make the technology work. In his new book, The Fourth Education Revolution, Sir Anthony Seldon argues that AI will bring about a fourth revolution in education. The first revolution occurred when early humans began to pass on basic knowledge about survival. The second started some 4,000 years ago and led to early schools and universities, but only for a very small minority of the population. A third revolution followed the invention of the printing press and by around 1600 the current “factory” education system was established. It has evolved only incrementally since – schools and universities now are fundamentally the same as they were 200 years ago. Other sectors such as finance, retail and transportation have been transformed by technology from where they were 200 years ago. The pace of change has increased recently through the uptake of IT and the impact of the internet. But little has changed in the way schools and universities operate. There were high hopes for IT in schools, but the results were mostly disappointing – an OECD report in 2015 found no link between what countries spend on IT in schools and student’s performance, a finding borne out in other studies. Just recently, artificial intelligence (AI) has become hot area of technology. It has come to public attention through successful applications in speech recognition and search engines, as well as by beating he best human players in chess and other games. But will AI enable education to move forward at last, leading to a fourth education revolution? This is the question we examine in this paper. students continue to share their teachers in classroom style teaching. Student focus – Another problem is the narrow focus of modern education. Educationalists such as Ken Robinson lament the rise of teaching systems that use rigid curricula, set simplistic standards and focus on learning how to pass exams. This is made worse where schools and universities concentrate on rankings rather than on providing the best education they can for each student. The result is a failure to provide the type of rounded education today’s students need, particularly when it comes to skills such as communication, reasoning, decision-making and creativity. Evidence-based learning – Education has been subject to more than its fair share of pseudoscience. For example, the UK Government once endorsed the idea of Educational Kinesiology in which one exercise is claimed to increase the flow of electromagnetic energy and help the brain send messages from the right hemisphere to the left. Important progress is being made to counter such nonsense including a more evidence-based approach. For example, the UK’s Education Endowment Fund combines education research with rigorous large-scale trials to find out what actually works. Can AI in education help in this area? Scaling up – Finally, current education systems are not capable of scaling to meet modern requirements. A hundred years ago, top quality schools and universities in developed countries provided a good education for a small elite, with everyone else receiving a basic education. This no longer meets the needs of modern economies or the expectations of their citizens. But there are not enough good teachers and other resources to provide the type of education previously reserved for the elite to everyone. In the developing world, the situation is more acute with some 1bn children needing a good education. Current systems simply cannot scale-up to meet these demands. Artificial intelligence can be simply defined as is where a computational system performs a task generally accepted to require human intelligence. AI was originally developed between the 1950s and mid-70s but, after initial expectations were not realised, there followed a “AI winter” with little progress being made. Interest picked up again in the mid-1990s, but practical applications were few and far between. The “big bang” for AI came after 2010 driven by much better computational platforms from companies such as Nvidia and access to large volumes of data mostly harvested using the internet. For the first time, the capabilities of AI are visible to the public and include speech recognition in Amazon’s Alexa, face recognition on the latest Apple smartphones, automated language translation from Google and cleverly targeted advertising on social media. Although of less practical use, the rapid pace of progress was also shown in 2017 when the UK company DeepMind demonstrated a system capable of teaching itself to be a world-class chess player in 4 hours with no prior knowledge other than the rules of the game. The branch of AI attracting most attention is deep learning. Deep learning is a development of artificial neural networks as originally developed in the 1960s. A neural network is a computer program implementing a network of interconnected neurons where each neuron takes the form of a simple mathematical calculation. The system can be trained using input data where the desired outcome is known, a process known as supervised learning. Such systems are good at recognising patterns in data, but their use was fairly limited before the advent of deep learning. In deep learning, the network of neurons is much larger and is combined with other data processing and training techniques. This is the system that led to breakthroughs such as image recognition, language translation and game playing. The main requirements are high performance computing and lots of data to train the system. Although spectacular results have been achieved, it is important to realise the applications where AI has been successful are very specific and self-contained – for example face recognition. This is a long way from anything resembling so-called generalised intelligence which humans show routinely. This is why it is proving much more difficult to apply AI to drive cars. Although this is still a contained task, its scope is considerably larger than, for example, playing chess. Thankfully, AI that in any way resembles the generalised intelligence depicted in movies such as Terminator remains pure science fiction. How is AI being used for education? At the moment, AI is being applied to education in relatively simple ways. For example, the Indian company Mindspark draws on a set of 45,000 questions and 2m answers per day to identify patterns in incorrect answers. When such patterns are recognised, the system recommends specific remedial exercises. In other cases, AI is used in language training systems to help students speak a foreign language. Common mistakes are recognised, and techniques recommended for correction. Another example is to provide students a natural interface to conventional teaching material in the form of an AI-powered virtual assistant capable speech recognition and synthesis. Somewhat more ambitions projects are taking place in California, although these are on a smaller scale and are not specifically focused on AI but rather on digital techniques in general. A good example is AltSchools where the focus is on personalised learning. Students have a personalised record of their progress and a playlist guiding them through a set of education content. In this way, teachers are freed up from the detail of marking and planning lessons. Instead they can focus on group working, social skills and one-to-one tuition. A criticism of AltSchools is their high cost. This is addressed in the Summit network of schools which also use digital methods and yet are targeted at poorer students. In this case, students spend around half their time on teacher-led project work using time freed up through digital learning methods. Mobius has been leading another initiative in which digital education is applied to provide a better education to more than 5m public school students in Saudi Arabia. This is done through a mix of online lessons, one-to-one virtual tutoring and high-quality content. The system will be provided to students outside school hours to lift standards in a country where public education ranks poorly against other countries. Ascertaining the actual uptake of AI in education can be confusing since many education companies claim their products utilise AI methods to improve performance. Few details are normally provided and much of this “AI” is likely to be marketing rather than reality. It is concluded AI is starting to have an impact in education but, for now, is a long way short of the claimed revolution. Despite the relatively low uptake so far, our view is AI can fundamentally improve education. Students will access a virtual tutor on their smartphone or tablet which will guide them through their educational journey. The virtual tutor will present content, set exercises and provide access to live lessons and real tutors. This will be done in a personalised way such that the main task of teaching is handled by the system enabling students (and their parents) to take charge of their own education. This will in no way diminish the importance of real teachers, schools and universities, but change their role to that of reinforcing and consolidating learning, providing one-to-one support where needed and teaching team working, social interaction, creativity and life-skills – topics that are sorely missing in many schools nowadays. Personalisation – It will for the first time enable true personalisation of education in a cost-effective way, including letting students take charge of their own education. Student focus – The benefits of personalisation will not be at the expense of the human and social education since AI will free schools and universities to concentrate on these areas. Evidence-based learning – There will be less room for pseudo-science and more reliance on proven learning teaching methods. This will come both from the design of the digital system and from data generated teaching large numbers of students. Scaling up – The approach advocated can be scaled to larger number of students since the focus for learning is shifted to automated systems. However, we are not advocating pure online education and it will remain important to balance the digital system with real teacher involvement. Another important technology is Experience API (xAPI). This provides a standardised interface enabling students to access content from a wide range of sources in a seamless manner and with a comprehensive learning record maintained for each student. The figure below shows a possible implementation of an AI based education system. For personalisation, it includes the sophisticated deep learning AI technique as well as more basic adaptive learning. 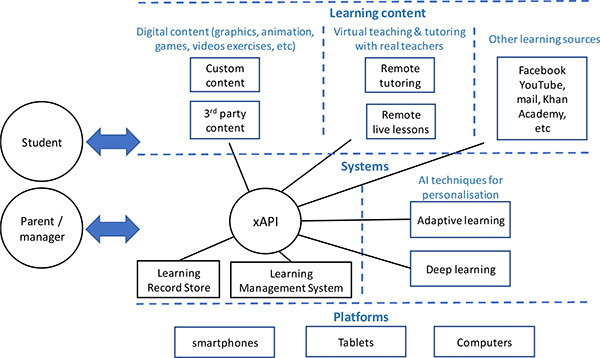 The system is held together with the xAPI interface which also supports a Learning Record Store where each student’s learning record is retained. Such a system could be used for school and university education, but is equally applicable to workplace and professional education. The majority of this system would be implemented using cloud services. Such cloud facilities extend to sophisticated AI processing as well as more routine IT style operations. A possible issue here is the security of information held on cloud servers, especially that related to students. This needs careful consideration, although in practice leading cloud providers operate rigorous security likely to be superior to anything operated directly by an education provider. The new GDPR regulation also provides a framework for dealing with this issue. AI for education needs to be supported by sound psychology, cognitive science and an evidence-based approach to what works. There has been a lot of talk on using AI for education plus a good deal of hype and marketing. In our view, now is the time for action to start delivering a revolution in education.